Navy To Begin Testing For Synthetic Chemical Compounds Chief of Naval Personnel Public Affairs, NAVY NEWS SERVICE WASHINGTON -- The Navy announced impacting Fleet Readiness. If a Sailor Mar. 12 that it will begin random testing makes a poor choice and uses these types of urine samples this month for synthetic of drugs, they need to know that there chemical compounds like Spice. will be consequences.” Commanders may take appropriate The initial testing will be conducted actions related to health, safety, and by a contracted laboratory, with Navy security based on a positive result. Every Drug Screening Laboratory capable of positive sample will be sent to NCIS conducting in-house testing later this for further investigation with a view year. towards potential disciplinary or adverse The Navy has been testing urine administrative action by the service samples seized from suspects during member’s command. criminal investigations for nearly a year. “There is zero tolerance for the use Navy and Marine Corps commanders of drugs - synthetic or otherwise - in can have urine samples tested for several our Navy,” said Vice Adm. Scott R. of the compounds found in Spice-like Van Buskirk, Chief of Naval Personnel. products at the Armed Forces Medical “Synthetic chemical compound drug use Examiner System (AFMES) when the impacts a Sailor’s career, their family sample has been collected in conjunction life and overall well-being while also with an ongoing investigation. The capacity for testing for designer drugs will continue to expand. During fiscal year 2012 the Navy will invest $1.73M to test for synthetic chemical compounds and expects to increase that amount to $2.9M in fiscal year 2013. The Navy continues to educate Sailors on the dangers of drug use to include new and designer drugs through targeted awareness campaigns and continues to work closely with local governments to identify users and distributors. This program is a key element of the readiness area of the 21st Century Sailor and Marine initiative which consolidates a set of objectives and policies, new and existing, to maximize Sailor and Marine personal readiness, build resiliency and hone the most combat-effective force in the Department of the Navy. 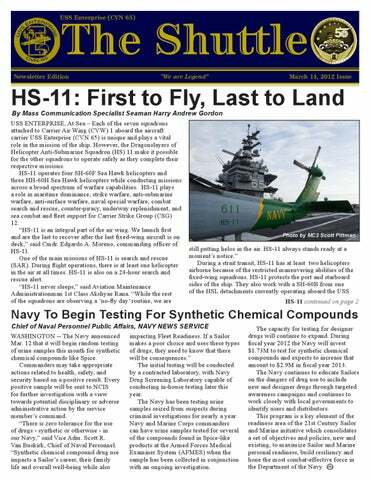 The Shuttle is published and printed daily underway and bi-weekly in port by the USS Enterprise (CVN 65) Media Department, FPO AE 09543-2810. This newspaper is an authorized publication for members of the Department of Defense. Please direct all story ideas, questions and comments to MC1 (SW) Steve Smith at smithsw@cvn65.navy.mil. Commanding Officer Capt. William C. Hamilton, Jr.
3M 3M Question of the Day: What is the purpose of the CSMP? Yesterday’s 3M answer: The Department Head is responsible for determining IEM equipment status. by September. There has been no schedule set for the withdrawal of the remaining 68,000 American troops, although Mr. Obama said last year that the drawdown would continue “at a steady pace” until the United States handed over security to the Afghan forces in 2014. At least three options are now under consideration, according to officials at the White House, the Pentagon and the State Department. One plan, backed by Thomas E. Donilon, the national security adviser, would be to announce that at least 10,000 more troops would come home by the end of December, and then 10,000 to 20,000 more by June 2013. Vice President Joseph R. Biden Jr. has been pushing for a bigger withdrawal that would reduce the bulk of the troops around the same time the mission shifts to a support role, leaving behind Special Operations teams to conduct targeted raids. Vicksburg Departs For Final Deployment By Mass Communication Specialist 3rd Class Nick Scott, Enterprise Carrier Strike Group Public Affairs USS VICKSBURG, At Sea -- Guided-missile cruiser USS of service since its commissioning in 1992. Vicksburg (CG 69) departed its homeport of Mayport, Fla., “The mission must come first, the mission is why we are Mar. 9 to make its final deployment, this time as part of the here in the first place,” said Ensign Michael E. Fitzpatrick, Enterprise Carrier Strike Group. first lieutenant for Vicksburg. “The crew understands that Family members, friends and well-wishers gathered on and they are very professional.” the pier in the early morning hours to bid farewell to loved Although this is the last deployment for Vicksburg, ones and wish them good luck. mission readiness is still the key to success. “This is the first time I’ve deployed,” said Cryptologic “We must not view this deployment in terms of being Technician (Technical) 3rd Class Ronnie Mathis the last deployment,” said Capt. Logan Jones, commanding temporarily assigned to Vicksburg from the Nimitz-class officer of Vicksburg. “We are not looking for any final aircraft carrier USS Theodore Roosevelt (CVN 71). glory.” “It was difficult to leave my six-week old daughter and Jones also said that “at the end of the day we know wife behind, but the crew is really nice and is helping me that we will have served with honor, but we must not react get through it,” said Mathis. differently than we normally would in any given situation.” Deploying can be challenging for a lot of Sailors, even Vicksburg’s commanding officer is just one of the seasoned veterans who still must make sure all affairs ship’s crew looking forward to completing a successful ashore are in order. 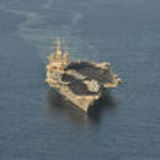 deployment as part of the Enterprise Carrier Strike Group “It doesn’t really get any easier,” said Navy Counselor team. 1st Class Brian S. Olinger, the career counselor aboard “I look forward to a deployment of working with Vicksburg. “I’ve been in the Navy for 19 years and this is maritime partners, flying missions and providing security,” my fifth and final sea deployment. No one wants to leave said Jones. “My job is to leave with 370 Sailors and return their loved ones behind, but we have a mission.” with 370 Sailors and that is what I intend to do.” This deployment marks the end of Vicksburg’s 20 years Vicksburg is scheduled to decommission in 2013. FC2 Adam Perez from Hobe Sound, Fla., joined the Navy nearly four years ago and finds it rewarding to have a job with purpose. Perez enjoys surfing, fishing and boating in his spare time. In the future, he plans to teach his sons how to surf. AMAA Amber Stevens from Seymour, Conn., joined the Navy a year and a half ago to travel, serve her country and go to college. In her spare time, Stevens enjoys reading, working out and working on her qualifications. Her future plans include retiring after 20 years of service and becoming a forensic pathologist.